Here are a few comments about my work from recent and long standing clients. For more online testimonials, check out my reviews on Angie's List, yelp, and google maps. To learn more about what I build and see if I am the right builder for you, click on one of the links above. "Peter has built for us a fence, garden gates and an arbor. All of his projects have been beautiful works of art. He focuses on details that make his product special. We have had many compliments on his projects and would not hesitate to use him for all of our woodworking needs. We love his work." "Peter Kirsch-Korff brought us a thoughtful and attractive solution for our new garden deck. Peter is an outstanding craftsman who pays attention to detail and takes pride in the quality of his work. He is thorough and reliable; our project was completed on time and within budget. It was a pleasure working with Peter. We’ll hire him again for our next garden design project." "Not just a deck builder, but an artist." "Peter is an unusual combination of skills. He has a good sense of historical perspective both in the west and the east. He also has creative artistry skills and finish carpentry skills. I have hired Peter for wooden fences, a wood and clear acrylic fence, an animal fence, garden structures, bookshelves, a fancy trash can enclosure and numerous wooden gates. The wooden gates and trash can enclosure gate have turned out particularly well. 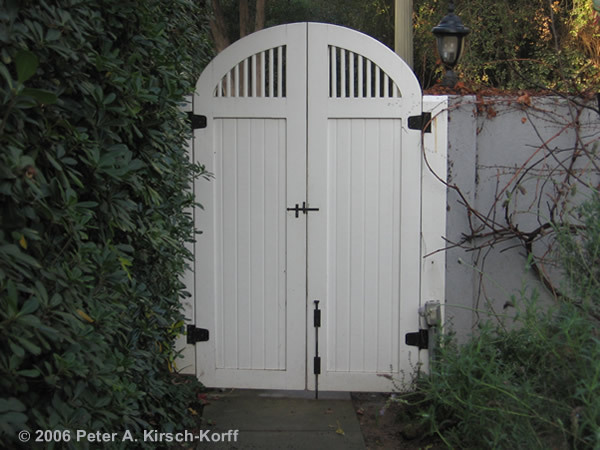 If you need a wooden structure, such as a gate, but want an artistic touch to it, Peter is a great choice." "Peter is who I call when we need something built or fixed. He is an amazingly meticulous craftsman, and I can look just about anywhere in my house and outside in my yard and see ways in which Peter has made my house more beautiful and more useful. I highly recommend his work."